The Bridgewater Club Golf Course is located in a traditional and exclusive country club community. When their golf course landscaping plans called for a distinctive cart and pedestrian bridge crossing to the first tee, they turned to Hemp Design. Working with the course’s architects, the Contech team helped bring their vision to life. The end result is a Continental ® custom designed painted steel structure with beautiful railing details that compliment the club’s unique architecture and charm. Deck lighting was integrated into the bridge design. It was installed and pre-wired at the factory. The 72-ft. long x 10- ft. wide structure has a poured concrete decking. 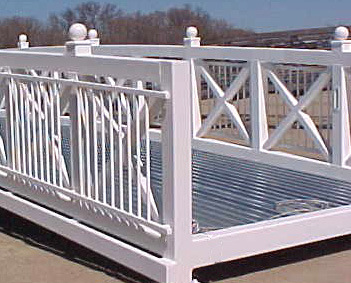 The ornamental treatment on the railing posts, along with the attractive white paint finish, makes this bridge look right at home in its beautiful surroundings. The bridge was delivered to the site and installed in one day.